How to Watch Rio Olympics 2016? How to Stream Rio Olympic Games? 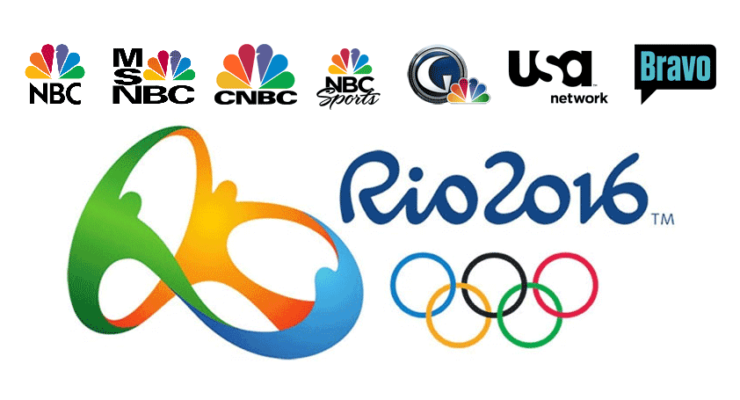 Olympics live coverage is available exclusively this year through NBC network of channels, which include: NBC, NBC Sports, MSNBC, CNBC, Golf Channel, USA Network, and Bravo among others. In total, NBC plans to run about 6755 hours of Olympics TV coverage (that is 281 days of air time – I will give you minute to think about it). The Rio Olympics Opening Ceremony is set to air on Friday, August 5th on NBC. Although, competition games will begin from Wednesday, August 3rd. Games will conclude on Sunday, August 21, with the closing ceremony also on NBC. Rio de Janeiro is 1 hour ahead of US Eastern Time and so catching up on Rio Olympic games on TV should not be an issue for many. Also, NBC will delay telecast of games until prime time in the US, which should help many viewers. NBC is a over-the-air channel and is also available as a local channel if you have cable subscription. The NBC channel will also telecast the Rio Olympics opening and closing ceremonies live. Over-the-top (OTT) Streaming services such as Sling TV, and PlayStation Vue, offer NBC in their basic line up. If you do not have any of them, NBC is also available through USTVNow plugin, which allows you to legally stream Rio Summer Olympics 2016 on a Kodi device such as Android TV Box, Fire TV and Stick, Windows, Ubuntu, Mac, or Raspberry Pi. Key Events: 260 hours of coverage, Opening and Closing Ceremonies, and most popular sports, including swimming, gymnastics, track and field, diving, beach volleyball, volleyball, and the men’s and women’s basketball finals. NBC Sports Network (NBCSN) will have the most Olympics coverage among any channel. NBCSN is not available OTA but is available through cable providers, PlayStation Vue, and Sling TV. In addition, certain Kodi Addons also can stream NBCSN and Mobdro App (See table at the end for links). With Sling TV or PlayStation Vue, you can enjoy watching Rio Olympics on devices such as Smartphone, Fire TV, Android TV Box, and more. Key Events: 330 hours of coverage, >20 sports, Team USA women’s soccer, Team USA men’s and women’s basketball, medals presentation, track and field, archery, boxing, cycling, fencing, field hockey, judo, open water swimming, rugby, shooting, soccer, synchronized swimming, table tennis, weightlifting, wrestling and more. Golf returns to Olympics for the first time in 112 years (though, many famous golfers won't be participating). Golf channel is available only through cable or as an addon package with OTT services such as PlayStation Vue and SlingTV. Some Kodi addons may stream Olympics, as well as, Mobdro App (See table at the end for links). Needless to say, this channel will focus primarily be on Golf. Key Events: 300 hours of coverage, and Men’s and Women’s Olympic Golf competition. USA Network, also brings Rio Olympic games on TV. USA Network is part of paid packages from cable providers, PlayStation Vue, and Sling TV. It is also available through few Kodi addons and Mobdro App. Key Events: 110.5 hours of Olympics telecast from Rio, men’s basketball, beach volleyball, cycling, rowing, synchronized swimming, volleyball, water polo, and more. Bravo is available through cable and certain OTT service providers listed in this article, as well as through Kodi Addons and Modbro app (See table at the end for links). Primary focus of Bravo will be Tennis. Key Events: 94.5 hours of live Olympics coverage, and Mens and Women's tennis. MSNBC, typically a news channel, is also one of the Rio Olympics live coverage channels. MSNBC is a paid channel through cable providers or one of OTT Service providers. You may also find MSNBC on some Kodi addons and Mobdro App (See table at the end for links). Key Events: 78.5 hours of Rio Olympics programming, men’s basketball, beach volleyball, rugby, soccer, volleyball, and water polo, among other sports. CNBC, is also one of the Olympics US TV channels that have live coverage. Typically, CNBC is a financial news channel, but temporarily will have Rio Olympics live telecast. CNBC is a paid channel through cable providers, one of OTT Service providers, Kodi addons, and Mobdro app (See table at the end for links). Key Events: 42 hours of Rio Olympic games coverage, elimination-round coverage of basketball and volleyball, as well as archery, beach volleyball, cycling, rugby, water polo, wrestling, and many more sports. Finally, Rio Olympics Live coverage channels also include a few other NBCU networks such as Telemundo (spanish), NBC Universo (spanish), and other specialty channels (Basketball and Soccer). In addition, nbcolympics.com and NBC Sports App will also stream about 4500 hours of coverage. However, these two options require you to have NBC subscription through your cable provider. Now to the million dollar question. It's great that NBC will cover the Olympic games in detail but how can you watch them? The major 7 NBC channels that carry Olympics live are available through OTA, Cable, OTT (PlayStation Vue and Sling TV), Kodi addons, and Mobdro App. A table is better than a 1000 words. So here is a nice little summary table with all relevant links to various methods to stream Rio Olympics TV channels. Complete Olympics Watching Guide for CordCutters Not in US? Get a VPN and gain access (15% OFF Link). @Temporary Rio Olympics 2016 promotion. Included free with any package. #NBC is available on demand only. &Some of the addons or apps may be legally questionable. Use your discretion or protect yourself with a VPN. As we publish more guides and update existing guides, I will keep updating the above table throughout the duration of Rio Olympic games. Once again, I would like to stress that no streaming method can provide the same video and audio quality experienced through cable. While OTT services such as Sling TV and PlayStation Vue are getting close they are not there yet in my opinion. On the other hand, cable cannot beat the cost of these OTT services. Most of all, there are no contracts involved with OTT services. In this post, we described all the Olympics live coverage channels in detail so you can be aware of what TV channels to follow. We also tried to present most commonly available options to watch and stream Olympic games on various devices. In the end, how you watch Rio Olympics 2016 is your choice and if you know of other options please share with others in the comments section.